Failure to plan is planning to fail. It’s an old adage that tells us that no matter what we do, we have to have an idea of what we are doing. If we just go at things randomly or willy-nilly, they typically don’t turn out overly well. Never fails. So what is your plan for the gym? Do you have one? And I don’t just mean for today, I mean for both the short-term AND the long-term? What’s the plan? You have to ask yourself where you want to go. But just as importantly, how are you going to get there. Then, once the plan is made, stick too it. Be on top of your idea. It’s the only way to succeed in anything that you do. Not just exercise, but everything. Life is WAY too crazy to just float through without any ideas of how you need to get where you need to go. That’s how people get stuck. So go out today and make a plan. Have an idea. BE SUCCESSFUL! It’s all in your head. You’ve heard it before. From your teachers, parents and friends. About topics from sickness to stress. Well, the same is true of exercise. It’s all in your head. Your performance, that is. You can see it in your work. If your head is in the game, you will perform better. If it isn’t, then you won’t. No exceptions. Now, what does that mean, is the question. It means stress is mediated. I’d say stress free, but stress is not only inevitable, but good (believe it or not). But it can be moderated and kept under control. It means that you are eating well and sleeping well. If you can manage that, then your workouts and performance will be stellar. You’ll be stronger, faster and thinner than you’ve ever been. If you cannot manage the mentals, then you’re in trouble. You’ll gain weight, lose strength and be generally miserable to be around. You have to be able to wrap your head around your head. Do it and you’ll be great. Good luck and go get ’em. We see it every day. We read it in magazines and see it on TV. The next best thing to help you lose weight and be a healthier person. And people buy in by the millions. If they didn’t, the ads and commercials and infomercials would go away. Don’t you think that there is a reason that these things are aired late at night? They know that the combination of late night TV, wine and credit cards are a horrible idea. That’s how my buddy ended up with a house full of knives. Think about it this way….if any of the “magic” pills, potions and serums worked, do you think that any others would survive in the open market? Of course not. If one worked for real, the rest would go away. We discuss this with our clients every day and still, sometimes, to no avail. The formula has to do with work and sweat. Sometimes tears and blood, but they are optional ingredients in the mix. 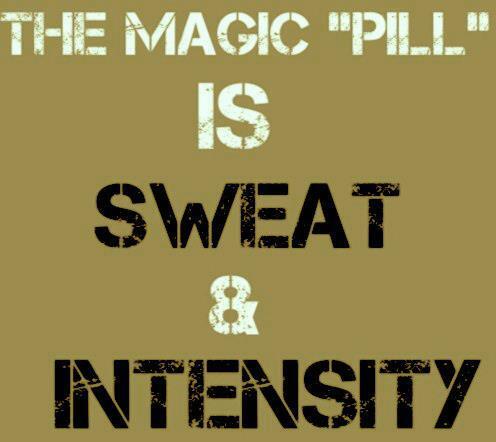 The truth is is that the magic pill is exercise. It’s not the formula that anyone wants, because it requires hard work and discipline. But, like it or not, it IS the answer. The harder we work, the more results we see. And we’ve discussed here, that hard work does NOT mean an hour and a half on the elliptical. No. Weights and work. Weights = muscles. Muscles = increased metabolism. Increased metabolism = decreased body fat. Simple. Straight forward. Truthful. So on Tuesday I wrote about why people gain weight. Today, I’d like to issue a challenge to all of you. Don’t. 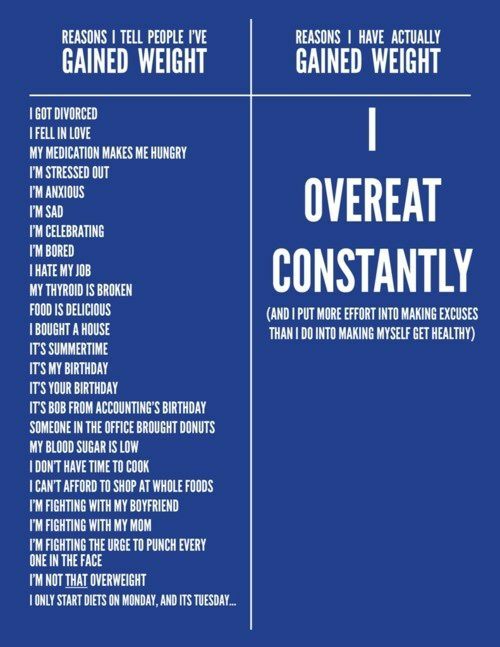 Don’t overeat constantly. Especially now. The time from Halloween until New Year’s Day typically is the downfall of every person who has EVER struggled with their weight. It’s candy, and pies, and office parties and family get togethers. It seemingly is an endless supply of empty calories and food with little to no nutritional value whatsoever. Now, I’m not saying that you cannot ever indulge. That you can’t have any days where you slip or celebrate or enjoy yourself. I am not of that belief. But I am of the belief that there has to be a note of moderation. For example, on Thanksgiving Day, I am going to EAT! My goal is to see if I can consume my body weight in turkey and pumpkin pie. But that’s one day. I”m not going to do that multiple times every week from now until January. On most of my other days, I’m going to be conscious of what goes into my body, as should you. That’s your challenge. Keep you consciousness about you. Don’t go hog-wild and try to rationalize it later. Think about it, if you’re good(ish) now, then it will be all that much easier to accomplish your “resolution” later. But I have a slow metabolism. But I have big bones. But I don’t have time. As trainers, we’ve heard them all. For the majority of our clients, the biggest fight that they ever have is with their weight. And for most of them, the problem isn’t keeping weight on, but taking it off. Whether it’s 5 lbs or 50, the wheel of excuses never ends. But the overwhelming majority of it comes back to one indisputable fact. I EAT TOO MUCH AND IT’S ALL GARBAGE! People bury their stress, hurt, angst and even happiness in food. We have a deep emotional connection to our food in this society. It’s been rooted deep in our psyche since birth. Food isn’t fuel, food is feelings. The only problem with this mentality is that most people become unable to leash the beast at some point. they can’t re-harness the ability to control what and how much goes into the system, and THAT, my friends, is what causes obesity and weight problems. 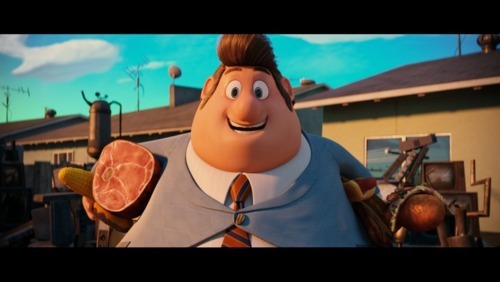 Your bones aren’t too big. Your metabolism can be adjusted. You have the same 24 hours that everyone else has. Whether you choose to make the most of it is up to you. Stop overeating and eating your feelings. Be healthy, be happy and be under control. So it’s a time that only comes up every 4 years. You need to get out and vote. Make your voice heard. Whether you agree with either or not, make a choice. Vote Obama, vote Romney, vote Independent. It matters. The greatest thing about our country is that we have the RIGHT to make that choice. Go to other countries. They don’t have that right. They have to deal with whoever has “divine” rights to a throne. We can choose, and so we should. And if you choose to NOT choose, then zip it. 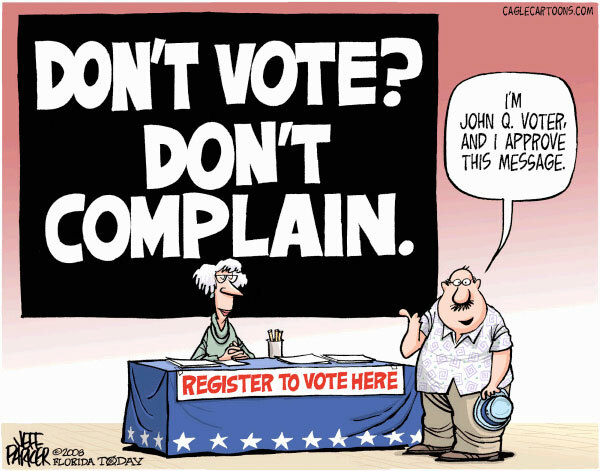 If you don’t vote, you don’t get to complain. That’s like someone not giving any input about dinner, and then bitching about the restaurant was chosen. Vote early, but don’t vote often. Get out there and make your voice heard.